This combination provides two ways to access the 12th edition of Standards for Relationship Testing Laboratories: print and electronic. 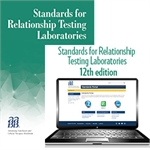 This edition of Standards for Relationship Testing Laboratories (RT Standards), effective January 1, 2016, features new and revised requirements in areas such as employee qualification, facility monitoring of potentially fabricated documents, and the identification of non-chain of custody cases. A multi-user license is available for this product at a discounted rate. The Standards Portal allows users to customize their profile based on the activities for which they are accredited and can be rearranged at any time. Standards that do not apply to a user’s profile will appear grayed out to ensure that purchasers are aware of the standards that apply to their facility and those that do not. The Standards Portal is also fully searchable by key word, chapter, or standard number, allowing users to navigate quickly to the most relevant standards to them at that time. Guidance is provided on how to implement a standard, why it was created, or why a change was made from this edition to the last. Any relevant documentation that would assist users in implementing the standard in question is provided. All links to outside websites and cross references to other standards in the portal are live and appear in popup windows to allow users to be able to see both the standard in question and the linked post. The full edition of the RT Standards (not including any guidance) is printable at any time to ensure that users can take the RT Standards on the go. Any interim or emergent standards will appear seamlessly in the portal once effective and highlighted. 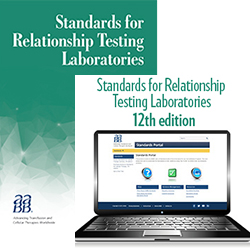 By purchasing the Standards for Relationship Testing Laboratories, 12th edition (“Standards”) through the AABB Standards Portal (“Portal”), users acknowledge and agree that they will access the Standards solely for their own personal and/or professional use and not distribute, copy or provide access to the Standards for use by any third parties. Furthermore, users will securely maintain their login and password for the Portal. In the event that AABB or its authorized agents discover that users have not complied with these Terms and Conditions of Use, they understand that they will lose all rights to access the Standards and will not be entitled to any refund. The 12th edition now requires that all laboratory directors, director designees and laboratory supervisors have official transcripts on hand. New standard 4.7.1 requires that all accredited laboratories have policies, processes, and procedures in place to respond to potentially altered or fabricated documents related to a potential relationship status. This edition contains a requirement that all laboratories have policies, processes, and procedures for identifying non-chain of custody cases. When purchasing multi-user licenses, you will be asked to assign access to specific individuals.